There are two areas in the assembly of the firewall and the spar bulkhead build-up where a builder might make an error like I did. The first is on the bottom of the firewall. There's a 3/4 x 3/4 x 1/8 angle that gets riveted to the firewall. It should NOT be flush to the flange. Instead, don't forget to allow a .040 gap for the F-321 forward belly skin. Yeah, I didn't pay enough attention there and made mine flush. I added some room for the skin by making a short piece of .040, beveling the forward edge, and used a clamp, with a block of wood against the firewall, to force it in. The flange is ductile and bent up to allow the strip to fit in. 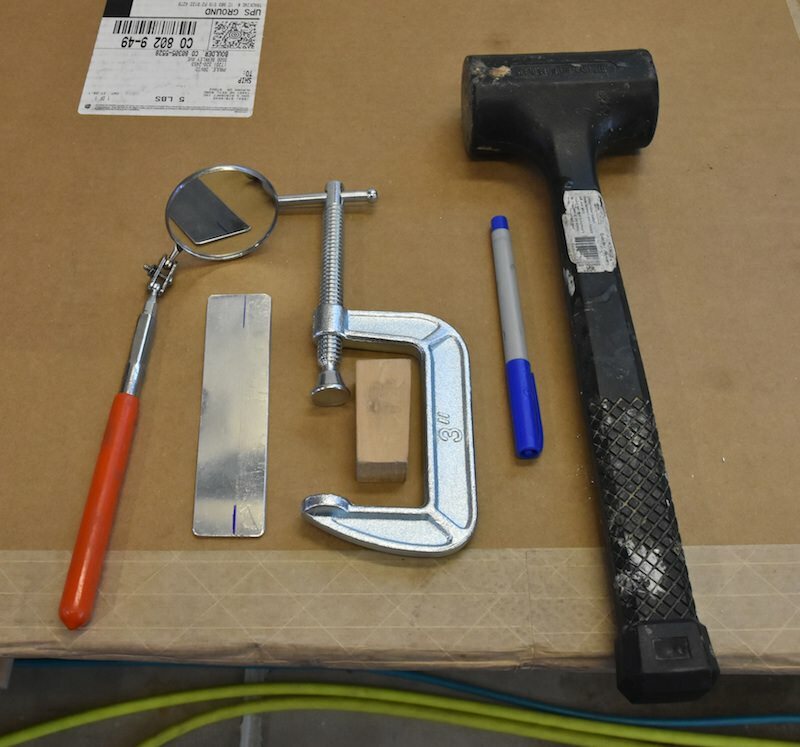 It didn't take much tooling. The hammer let me tap the flange flat again and that was easy. The marker let me keep track of where I was, and the mirror was handy to make sure the .040 strip was seated. The second area is the bottom of the F-303 spar bulkhead. This doesn't really affect the spar bulkhead itself, but the lower longeron parts and the F-312 firewall ribs need to be made to fit this correctly. The main thing is the height of these parts. They need to be flush with wherever the F-321 forward firewall skin lays on the spar bulkhead assembly as it's being built. I had to redo mine, since I didn't get it right. Remember that right in the center, the seat belly skins overlap at the dihedral break. 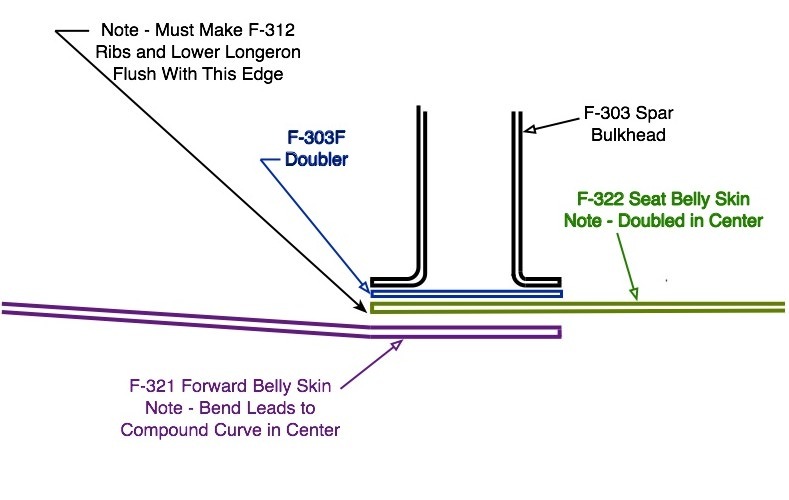 That won't affect the lower longeron and F-312 fit-up, but it will affect the F-321 forward belly skin itself, which has a compound curve there. Here's how it should be. (And here I'm referring only to the forward lower longerons). I made my panel 1/2" taller than stock, all at the bottom, and still had 3.7" to the stick. That's without a stick grip, though. YMMV. The dimensions above are to the stock panel bottom, not my extension.